SHENANDOAH JUNCTION – Dozens of T.A. Lowery Elementary School students got a jump on Earth Day recently when they worked with area conservationists to plant trees on their campus. That’s when representatives from the Elks Run Watershed, Cacapon Institute, Jefferson County Izaak Walton League of America and The Downstream Project joined forces with teacher Marsha Young, who successfully applied for a Project CommuniTree grant after finding out how much her students would learn about the environment while planting trees. “For example, we do need trees on the playground to give them shade. They are also learning about science and the environment because trees are important to animals as well as help provide habitat,” she said, smiling as youngsters eagerly began to arrive to do their part behind the school. Every day is Earth Day at T.A. 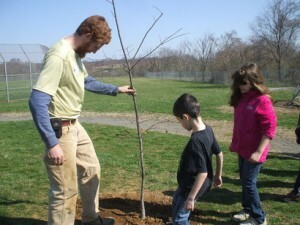 Lowery Elementary School, where Cacapon Institute urban forestry coordinator Tanner Haid recently assisted students as they planted 16 new trees on their campus. The school’s students are no strangers to conservation projects because they have an ongoing tree-planting project — including a walking path featuring trees that are native to West Virginia. “We also want them to know how important trees are when it comes to healthy air and clean water,” Young said. Sixteen trees, each measuring 6- to 10-feet tall, were planted April 10, including several native species such as white oak and some flowering trees such as dogwood, redbud and serviceberry that will help add color in the spring, she said. “On the walking trail we decided to plant sugar maples because they are the state tree of West Virginia and they will be especially pretty in the fall,” Young said. Urban forestry coordinator Tanner Haid said the Cacapon Institute’s Project CommuniTree has become popular since its 2008 inception in Moorefield. “In 2011, we received significant funding to increase this work throughout the eight counties of the Eastern Planning – the Potomac River headwaters that drain into the Chesapeake Bay. We’ve already done 47 projects at community sites – schools, parks, road right-of-ways. Any of these kinds of places can apply for a CommuniTree kit, which includes trees, mulch and just about everything they need. The kits are free, the groups just have to organize the planting,” Haid said, adding that an additional 19 projects are scheduled for this year. “This year we will be planting a little over 500 trees, and the program as a whole is probably responsible for about 1,500, so we’ll be getting close to the 2,000 mark soon. They picked a good mix of shade and flowering trees to plant here, so that should work out well,” he said. In addition to helping children in six classes plant trees, Haid also explained how their efforts would benefit the watershed – a term that some students hadn’t heard before, but quickly wanted to know more. “Always remember that whatever any of us does has an impact on someone else,” he said, as several students nodded in agreement. Darrell Propst, conservation committee chairman for the local Izaak Walton group, said this is the kind of activity in which he and other members are happy to help. “We could plant trees anywhere. But what we like to encourage is that cooperation among others, especially our young people, because this kind of hands-on activity teaches them to appreciate nature and their environment,” Propst said. “It’s been clear that a lot of the kids were really excited this morning, girls as well as boys. And this is definitely better than kids wanting to just sit on a couch playing video games. After we get going, they are usually all pretty excited about getting dirty,” he said with a chuckle. – Staff writer Jenni Vincent can be reached at 304-263-8931, ext. 131. © Copyright 2014 Journal News. All rights reserved. This material may not be published, broadcast, rewritten or redistributed.